Thank you dear studs for saving my lazy day outfit. Actually, I wasn’t really lazy to dress up this day, I was just swamped with so much work I didn’t have time to style myself properly, put on makeup and even comb my hair. I did manage to apply red lippie on though. I mean, the least I can do is look alive. LOL! It was really great timing that I just got these clothes and shoes from Cinderella a few days before. They were lying on top of the pile of clothes in my closet. I was in such a hurry that when I saw studs and leather, I figured these would do! Good thing, Cinderella is a one-stop shop for everything! Speaking of Cinderella, I heard it’s branch at Alabang Town Center just got a facelift and was recently renovated. The grand launch took place last September 26 with plenty fashion influencers and personalities in attendance. Too bad I missed it! Cinderella’s planning to renovate its other prime branches too so maybe I can catch one of those! It’s an exciting time for Cinderella, isn’t it? Follow Cinderella on Facebook, Instagram and Twitter to get updates. Cinderella is located in SM Megamall 2F Bldg A, Glorietta 3 GF, Alabang Town Center GF Town Plaza, Filinvest 2F, Robinson’s Ermita GF Midtown Wing, SM Fairview GF near main entrance, SM Manila 2F, SM San Lazaro 2F, Sta. Lucia GF Phase 3, SM North EDSA GF Main Bldg, SM MOA 2F, Virramall GF, SM Clark GF, SM San Lazaro 2F, Abreeza 2F, Embarcadero GF, and Lucky Chinatown 3F. I didn’t know PrettyFIT was inside Cinderella too! Aside from its branch in Robinson’s Place Ermita-Midtown, it’s also available in Cinderella stores at Glorietta 3, SM Megamall, Alabang Town Center, Filinvest, Virra Mall and SM North EDSA. PrettyFIT is exclusively distributed in the Philippines by Cinderella Marketing Corporation. Aaahhhh could i mimic this style Miss Camille? Whoaa! At last naka-bisita na ulit ako sa blog mo. Oh my! I hope you’re okay!! I totally understand your absence! Opo Miss, until now. And ang lalakas ng pag-alog. Kahapon nga may tunog pa talaga ng vibration at ang tagal matapos.Nakakalokaaaaaa! Parang laging 50/50 buhay nami. Takot nga akong matulog dahil baka nadaganan na ako ng bubong pag gising. Oh no, sana it stops soon! Hindi p todo nag effort yan.. I envy u.. :D you always inspire me..
Yung totoo? Nagmadali ka talaga niyan? Parang hindi ka naman nag ninja moves hahaha! STILL STUNNING! I looooove the top! Doesn’t really look lazy outfit. I also like putting my hair in a bun when I am too lazy or too busy to even comb my hair. Hahaha. I do always love your look on each blog post; so fly. We, from Cebu, hoping we could have a handshake and pic with you. LOVE the studs! You really amaze about the way you mix match clothes. You rock! Celine sunnies and Ray Bans are the best if all the world´s sunglasses <3 You look ADORABLE! Hey, I did not not notice the studs on your denim, they look cool. 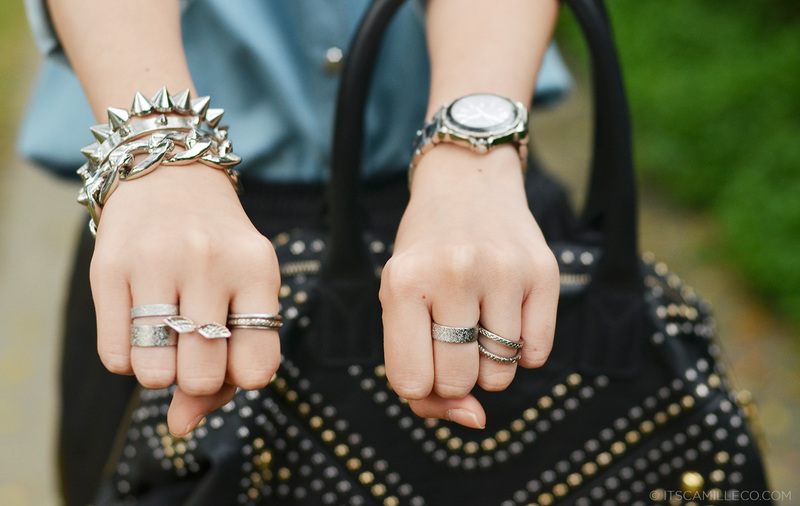 Studs, denim and leather, you cannot go wrong with that. Ooo, I have a similar top and those shorts so I’m gonna try recreating this look! Simple yet stunning! Love yer red lips :) HAHA Go! Great look. Love the studs on your shirt. Super rushed! :) Thank you Christine! I have so much love for this outfit! So simple yet so chic! Your Celine spectacles look so good too! You should wear sunnies more often! Suits you well! Karen Walker sunglasses are always so nice din! Do you own ba some Karen Walkers? btw I saw you in IG wearing a GORGEOUS pair of gladiator sandals sa trip mo to Malaysia with your fellow bloggers! Those are SOOOOO NICE! Can’t wait for you to blog about your trip there and the outfits you wore! Simply superb! This is an ensemble that covers everything from edgy to feminine to causal! Literally, from top to bottom, there is something that stands out. It’s amazing that you wrote this as a “lazy day/in a hurry” outfit. I’m very much impressed with your flair! Cinderella has always been one of my favorite places to go for chic and casual pieces. 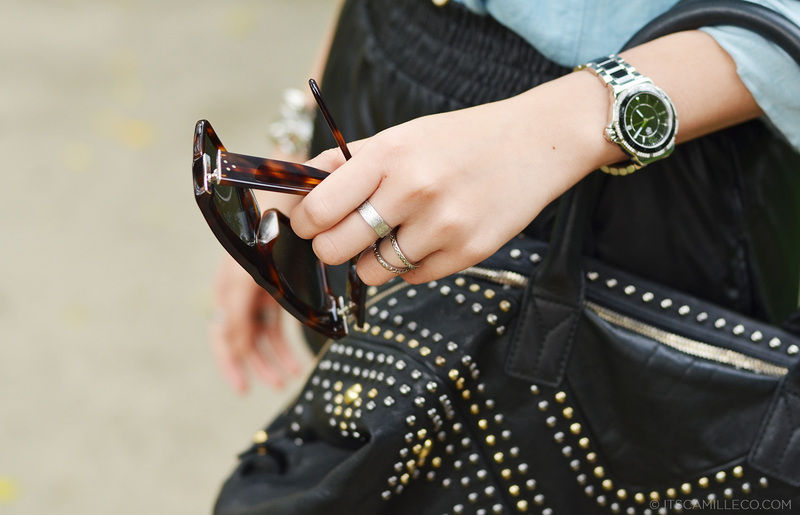 I wish I found a denim top like yours because the silvery stud detail is awesome! I also noticed that your shorts and bag are the ones that match this time, and these leather picks are great for your style-savvy persona. The fabrics are supple and comfortable. The versatility is what I admire for these two pieces. As for your shoes, you’ve done it again! You threw in a printed piece that incorporates your quirks into such an elegantly casual outfit. The optical illusion the print gives off makes your footwear look rather bubbly despite the color. It’s an excellent mixup with your red hue of lipstick plus the shape of your sunglasses. You can still grab one! I got this denim top only recently :) Thank you again for the nice words Angelic! I love the cool vibe!! :) And those shoes are cute..
Great combo, I particularly love your shoes and bag. Sent you an email as well please. Let me know what you think. Yes it is! :) One-stop shop!